Did you know that 5.7 million people receive emergency food assistance from Feeding America every week? To help combat hunger, Hamburger Helper® has partnered with Tim McGraw to help Feeding America deliver millions of meals to local food banks. Hamburger Helper has already donated more than half a million dollars and will contribute up to an additional $100,000 to Feeding America! The 17 cents Hamburger Helper donates per code is enough for Feeding America to deliver one meal to a local food bank!!! 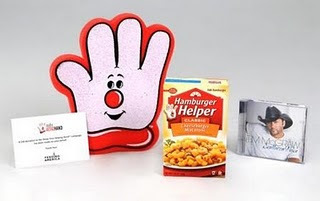 Hamburger Helper is also making a $10 donation to the Show Your Helping Hand™ campaign on behalf of My Money Mission Online! HOW COOL IS THAT!! Don't you just love that foam hand! I hope you will all take a chance to visit http://www.showyourhelpinghand.com/ and enter in some codes!!! To enter this giveaway, all you have to do is tell me what your favorite Hamburger Helper flavor is. Mine is definitely the cheeseburger one...YUMMY!! This giveaway will be open through November 27, 2010 11:59 CT. I will then choose a winner through Random.org and notify you by email. You'll then have 48 hours to provide me your contact information! If you now have a craving for Hamburger Helper, and would like to make this for your family, click HERE for a Hamburger Helper .35/1 printable coupon good through 11/30! My favorite flavor is the Lasagna! I follow My Money Mission ONline. My favorite Hamburger Helper flavor is Cheesy Baked Potato :) *Thanks* for the giveaway! My favorite Hamburger Helper is really the Chicken Fried Rice. Yummy! But we eat the hamburger kind, too. I entered your Mozaik giveaway.